In the midst of a terrible national illness, we organize and march for the known and solid cures. For democracy and our natural planet. We have clear direction on both issues. This weekend’s massive, powerful women’s and other marches rocking the nation have dwarfed the turnout for Friday’s illegitimate inauguration. With them we must demand—-and WIN—-a voting system that actually reflects the will of the people, and an energy supply that comes in harmony with our Mother Earth. For democracy: we must have universal automatic voter registration, transparent voter registration rolls, a four-day national holiday for voting, elimination of all electronic voting machines, universal hand-counted paper ballots, automatic recounts at no charge to the candidates, an end to the Electoral College, a halt to gerrymandering and a ban on corporate money in our political campaigns. It’s a towering agenda. But without it, we have no structural power. It’s the essential key to the one thing that can ultimately reverse a disease like this Trump presidency—-real electoral democracy. For our Earth: Energy is the key. Our survival on this planet demands a ban on all fossil and nuclear fuels, and an organic economy based on 100% renewables. The Solartopian transition is well underway in Germany, Denmark, Norway, Switzerland, Costa Rica, Iceland, at least parts of China and elsewhere. Far more Americans now work in green energy production and efficiency than for King CONG—-coal, oil, nukes and gas (www.nukefree.org). The economic and technological momentum is with us. Despite Koch-funded attempts to stop it, the transition to a green-powered Earth is well under way. Number one is stopping corrupt subsidies to decrepit, carbon/heat-spewing nukes before the next one explodes, and shutting the fossil fuel industry before it burns the planet to a crisp. There are many many more things we can and must win. But through the tears of Friday’s tragedy and the power of this weekend’s marches, we need to cope with the source of this devastating disease. Trump is payback for our imperial sins. He’s the vulture come home to roost for so many dictatorial kleptocrats the US has imposed on smaller nations over the years: Pinochet, Mobutu, Suharto, Somoza, Marcos, Duvalier, Diem, Ky, Saddam, the Shah…the list goes on. These corrupt, repressive servants of the American corporate empire have inflicted untold suffering on millions of innocent people for far too long. These dictatorships have formed the unjust source of much of this nation’s material riches. 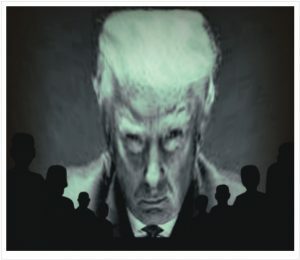 Trump has brought home the infection: imperial, greedy, misogynist, incompetent, uncaring, egomaniacal, sociopathic, a destroyer of the Earth. This is what we’ve been imposing on the rest of the world for so many decades. He is part of the price we pay for corrupting other countries and wrecking the lives of so many innocents within them. Our agencies have done this under the illusion of democracy. The client states “elect” their leaders. If unsuitable to US corporate interests, that leader disappears, and the client colony gets to try again. Likewise the Trump regime now takes power amidst a classic imperial “strip and flip” black op coup. Leading up to the election, millions of black, Hispanic, Asian-American, Muslim and other citizens were stripped from the voter rolls, as they have been for decades. Where that was not enough, black box electronic voting machines have flipped the final outcome, not only for the presidency, but for the House, Senate and state and local governments throughout the US. Both tactics were used to eliminate the grassroots leftist Bernie Sanders. When the corporate Democrats refused him the nomination, and then the Vice President’s slot, they trashed the youthful activist uprising that put Barack Obama in the White House, and that is the key to our progressive future. The moneyed liberal elite made it clear they preferred having Donald Trump in the White House over a social democrat, even in the second slot. The election was then flipped to Trump despite his losing the popular vote count by some three million ballots. The deal was sealed in Florida, North Carolina, Pennsylvania, Michigan and Wisconsin, where Hillary Clinton won the exit polls but lost the Electoral College. The corporate Dems then refused to support recounts while the media heaped abuse on the Green Party’s valiant Jill Stein for daring to challenge corrupted outcomes that were obviously illegitimate . Indeed, Clinton’s corporate Democrats sealed Trump’s coup by refusing to challenge the nationwide stripping of the voter rolls, or the flipping of the vote count in the key swing states. They haven’t even raised the issue of an Electoral College that has now for the sixth time put the loser of a popular election into the White House. Instead, as they screamed at Ralph Nader after Florida 2000, they now howl about the Russians. But the real corruption of our elections is right here at home. High atop the list of our real problems are our fake democracy, and a fossil/nuke industry that is destroying our planet. The social movements needed to win these battles are alive and well. From Occupy to Black Lives Matter to the Green/Bernie campaigns to the Dakota Pipeline to this weekend’s mass marches and beyond, we inhabit a vibrant body politic that is firmly committed to justice, social democracy and a sustainable Earth. With this terrible coup in Washington we shed some tears and feel some fear. We are mourning. But we are marching, and we are organizing. And the imperatives are clear. We need to win a true democracy, a Solartopian Earth, equal justice for all, a definitive understanding that we are all created equal, and endowed with an inalienable right to survive on this planet. Trump reminds us that it will not be easy. We need to remind him that he’s just a blip, a tiny toxic bend in the arc of history that bends toward justice—-if we make it so. In that, we have no choice. See you on the barricades. Bob Fitrakis & Harvey Wasserman have co-authored numerous books on election protection, including THE STRIP & FLIP SELECTION OF 2016 at www.freepress.org, where Bob’s FITRAKIS FILES also appear. Harvey’s SOLARTOPIA! OUR GREEN-POWERED EARTH is at www.solartopia.org. All too rare is the sporting event that qualifies as a great work of art. And even rarer is the professional sports team that belongs to the public. The transcendent Green Bay Packers have now entered the Pantheon for both. By way of disclosure, I am a part owner (two shares) of the Packers, which is part of the point. The team, from the tiniest media market in American sports, is owned by the public. Back in 1922, the team hit hard times due to some bad rainouts. To save the franchise, local business leaders established a nonprofit to take up the slack. Nearly a century later, the franchise and the stadium are still owned by the community. Praise be!!!!! American professional sports is now a sinkhole of cynical corruption. Except for the Packers, our football, baseball, basketball, and hockey teams are owned almost exclusively by a bunch of Trumpish billionaires. There’s Donald Sterling, former owner of the Los Angeles Clippers, whose racist epithets and public jealousies of Magic Johnson were beyond unbearable. And Dan Snyder, current owner of the football team in our nation’s capital with the blatantly racist anti-indigenous nickname he has vowed to keep forever. And, there’s the management of baseball’s Cleveland Indians, who may or may not be phasing out the most vile, racist logo in all of sports. Worse is the grinding corporate grayness with which these franchises are manipulated as owners manipulate the fans’ love for their teams by blackmailing billions in tax breaks, stadium subsidies, and outrageous ticket prices to gouge every last cent they can get. The most recent travesty involves the double-move of the St. Louis Rams and San Diego Chargers to Los Angeles—which would be far better off without either of them. In both cases, decades of loyal hometown fan devotion has counted for nothing. Nor have the billions the host communities have poured into those teams, only to be left holding very large municipal stadiums and other financial bags now absurdly empty. If those teams had been owned by those towns, like the Packers, this would not be happening. Of course the NFL cartel HATES the Packers. The combine now has on its books an actual law banning further community ownership of any NFL franchise. But the Packers themselves will not be moving to a bigger media market. Nor will they be enriching some yacht-riding, cognac-guzzling fat cat, or the bottom line of some faceless mega-corp.
Several years ago, the Packers management decided to offer shares in the team for public sale. I snapped up two. There are zero benefits beyond bragging rights and a certificate. No discounts for seats. No dividends. No accretion in value for re-sale. No free dinners with the players. When I asked the main office about deeding one of my shares to a nephew who wants to be a sportscaster, I was told I could not sell or pass on the shares beyond immediate family. A few years ago, there was a women’s basketball team in Columbus called the Quest. It had a great star named Katie Smith and won the first two championships in its nascent league. But then the team ran out of money. At the second championship game, I begged the owner to sell the franchise to the city. He looked at me like I was a cross between a conspiracy theorist and a Commie terrorist. The league went out of business. Columbus no longer has a professional women’s basketball team. Nice work, former Quest owner. 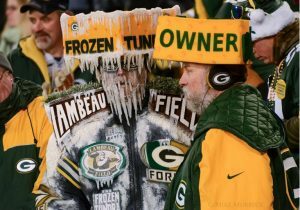 Given the choice, most NFL owners and network moguls would probably love to see the Packers go out of business, out of Green Bay, and into the control of fact cats. But, as a stockholder, I say all major sports teams should be owned by their host communities. Which gets me to Sunday’s game. The Packers began the season with four wins and six losses, having suffered a series of major injuries. They seemed to be going nowhere. But transcendent quarterback Aaron Rodgers predicted the Pack would “run the table” and win all six upcoming games and make the playoffs. It seemed like a throwaway line. But Rodgers is arguably the sport’s greatest quarterback, a terrific passer and an amazing scrambler with a brilliant football mind. He owns the on-field presence of a zen master. He has also been scandal free and signed a petition to recall Wisconsin’s right-wing governor Scott Walker. The Packers did run the table, then won their seventh straight game, beating the New York Giants in the playoff wild card game. On Sunday, they faced the powerful Dallas Cowboys (13-3 in the regular season), with a brilliant rookie quarterback from Mississippi State and a dominant rookie running back from Ohio State. Dallas has a whole history of its own. That includes the obnoxious marketing assertion that it is “America’s Team” even though it’s owned by a highly reactionary corporate elite. The Packers took an early lead only to have the Cowboys come from behind to tie the game in the final quarter. With just minutes to go, the Packers retook the lead with an astounding 56-yard field goal. The Cowboys then tied the game again with another brilliant drive and not-quite-as-long field goal. With less than a minute left, it seemed like we were headed for overtime. And the Pack has a sorry history of losing big games at the last minute. On the other hand, Rodgers has a history of pitching high, long “Hail Mary” passes that somehow get caught. Bottom line: With time for just one play to get in field-goal range, Rodgers rolled left and pitched a perfect right-armed strike thirty-six yards down the sidelines to Jared Cook, who made a spectacular catch that will be forever embedded in NFL lore. The Packers’ kicker, Mason Crosby, then converted another fifty-plus-yard field goal to win the game. Except that the Cowboys called time-out just before he got it off. So he did it a third time! The Pack now travels to Atlanta, hoping to get to the Super Bowl, to face either the Pittsburgh Steelers or the New England Patriots, who are coached by Bill Belichick, the Darth Vader of American football. Whether or not they win it all this year, the Green Bay Packers are an exemplar for what a professional sports team can be. All these franchises should be publicly owned, so they can stay in places like Green Bay and St. Louis, San Diego and Columbus. Where we home fans have secure community ownership, and can wholeheartedly embrace fantastic triumphs like this amazing run from the fabled Pack. Harvey Wasserman once played many sports, and was captain of his high school tennis team. Like most former athletes, he finds that the older he gets, the better he was. 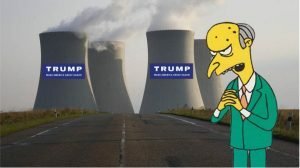 Mr. Burns, Matt Groening Productions, Inc. Published by HarperPerennial. The Simpsons & 1990 Twentieth Century Fox Film Corporation. In the area of energy policy under the presidency of Donald Trump, two concerns loom above all others. One is Trump’s support for nuclear power and fossil fuel energy, at a time when other powerful countries are going renewable. Trump’s economic commitments to nuclear energy and fossil fuels contrast sharply with China’s massive new commitment to energy sources including solar and wind. If China, the world’s number-two economy, joins Germany (number four) and possibly Japan (number three) in converting to 100 percent renewable sources, the U.S. economy will be left in the dust. The other concern is geriatric atomic reactors. The nation’s 99 nuclear plants now have an average age of more than thirty-five. Some, like Ohio’s Davis-Besse, are literally crumbling. Others, like New York’s Indian Point, and Diablo Canyon on the California coast, are surrounded by active earthquake faults. A single Fukushima-scale disaster at an American reactor could poison millions, destroy our continental eco-system, and bankrupt our economy. Sixty years after America’s first commercial reactor opened, not one can get private liability insurance. When the next one blows, the public will be stuck with the damages, which could easily soar into the trillions. Nuclear waste management has already failed miserably. In February 2014, a single barrel of radioactive trash exploded at the hugely expensive state-of-the-art disposal facility in Carlsbad, New Mexico. More than a dozen workers were irradiated and the facility was shut for more than two years at a cost of more than $2 billion. Now the nuclear-utility lobby nationwide is strong-arming state governments for massive bailouts to prop up decrepit reactors. In New York, Governor Andrew Cuomo recently approved a $7 billion handout for money-losing upstate reactors that cannot compete with fracked gas or renewables, whose owners wanted them shut, and whose extremely serious safety issues grow more severe every hour. In Illinois, the nuclear lobby has won more than $2 billion to sustain three ancient reactors that are literally falling apart. Ohio’s FirstEnergy is now begging the Public Utilities Commission and state legislature for billions to keep running the infamous Davis-Besse reactor, which has suffered numerous accidents and whose shield building is literally crumbling. In Michigan and elsewhere, as utilities move to shut the most dangerous and money-losing reactors in their obsolete fleet, the nuclear lobby is crying for more taxpayer handouts, both state and federal. The Nuclear Information & Resource Service estimates the public cost of a nationwide wave of such bailouts at about $280 billion. In business terms, that’s like jumping into the mass manufacture of Edsel automobiles, or turning away from cell phones to stake our future on land lines. In New York, Cuomo did finally move to shut two badly deteriorated reactors at Indian Point, but then diluted the decision by allowing them to operate for several more years. In California, a deal to shut two reactors at Diablo Canyon allows them to operate (also with expired licenses) well into the 2020s even though they are surrounded by a dozen earthquake faults. Trump is expected to pour federal money into the nuclear kitty. The incoming president says he “loves solar,” but has also said it’s too expensive. It’s likely that Trump will end tax credits for renewable energy, which has been a major support for emerging industries, and decimate Obama’s Clean Power Plan, which would have pushed states to cut power plant emissions. And Trump’s pick for energy secretary, former Texas Governor Perry, has been deeply supportive of the growth of fossil fuel and nuclear industries in Texas throughout his career. But things are shifting on the international scene. China’s cities are choking on lethal air pollution from its consumption of coal, and while the Chinese are still debating a potential major commitment to nuclear, they have alsocommitted to a $365 billion investment in renewable energy by 2020. Similar things are true of Germany and its energiewende commitment. Immediately after the 2011 catastrophe at Fukushima, German Chancellor Angela Merkel ordered the shutdown of eight reactors, with the rest of Germany’s nuclear power plants planned for closure by 2022. Tens of thousands of Germans put solar panels on their rooftops, rendering many communities energy self-sufficient, and dropping electricity prices throughout the country. The glut of cheap energy has forced numerous fossil fuel and nuclear energy plants to shut, leading to disruptive crises in supply and pricing. But the transition will sort itself out, establishing Germany as a dominant supplier of clean electricity, giving it the industrial high ground in Europe and on a global scale. Japan may soon follow suit. Despite the pro-nuclear stance of Prime Minister Shinzo Abe, a massive grassroots movement has prevented the reopening of nearly all Japan’s fifty-four reactors. 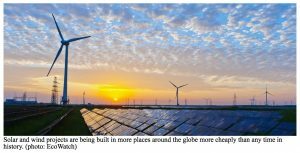 A number of smaller countries have also made substantial investments in renewables, including Norway, Denmark, Iceland, Switzerland, Costa Rica, and Scotland. Even oil-rich nations are getting in on the renewables game. The United Arab Emirates just announcedplans to invest $163 billion in renewables to generate half the nation’s power by 2050. Meanwhile, the United States continues to bleed billions to prop up dying coal and nuclear industries. Nuclear bailouts like those in New York and Illinois are crippling a transition that the U.S. must make if it is to have a competitive future in world industrial markets. Harvey Wasserman is co-founder of the global grassroots No Nukes movement and author or co-author of twenty books, including Solartopia! Our Green-Powered Earth (solartopia.org), and The Last Energy War (Seven Stories Press). s you ride the Amtrak along the Pacific coast between Los Angeles and San Diego, you pass the San Onofre nuclear power plant, home to three mammoth atomic reactors shut by citizen activism. Framed by gorgeous sandy beaches and some of the best surf in California, the dead nukes stand in silent tribute to the popular demand for renewable energy. They attest to one of history’s most powerful and persistent nonviolent movements. But 250 miles up the coast, two reactors still operate at Diablo Canyon, surrounded by a dozen earthquake faults. They’re less than seventy miles from the San Andreas, about half the distance of Fukushima from the quake line that destroyed it. Should any quakes strike while Diablo operates, the reactors could be reduced to rubble and the radioactive fallout would pour into Los Angeles. Some 10,000 arrests of citizens engaged in civil disobedience have put the Diablo reactors at ground zero in the worldwide No Nukes campaign. But the epic battle goes far beyond atomic power. It is a monumental showdown over who will own our global energy supply, and how this will impact the future of our planet. On one side is King CONG (Coal, Oil, Nukes, and Gas), the corporate megalith that’s unbalancing our weather and dominating our governments in the name of centralized, for-profit control of our economic future. On the other is a nonviolent grassroots campaign determined to reshape our power supply to operate in harmony with nature, to serve the communities and individuals who consume and increasingly produce that energy, and to build the foundation of a sustainable eco-democracy. The modern war over America’s energy began in the 1880s, when Thomas Edison and Nikola Tesla clashed over the nature of America’s new electric utility business. It is now entering a definitive final phase as fossil fuels and nuclear power sink into an epic abyss, while green power launches into a revolutionary, apparently unstoppable, takeoff. In many ways, the two realities were separated at birth. Edison pioneered the idea of a central grid, fed by large corporate-owned power generators. Backed by the banker J. Pierpont Morgan, Edison pioneered the electric light bulb and envisioned a money-making grid in which wires would carry centrally generated electricity to homes, offices, and factories. He started with a coal-burning generator at Morgan’s Fifth Avenue mansion, which in 1882 became the world’s first home with electric lights. Morgan’s father was unimpressed. And his wife wanted that filthy generator off the property. So Edison and Morgan began stringing wires around New York City, initially fed by a single power station. The city was soon criss-crossed with wires strung by competing companies. But the direct current produced by Edison’s generator couldn’t travel very far. So he offered his Serbian assistant, Nikola Tesla, a $50,000 bonus to solve the problem. Tesla did the job with alternating current, which Edison claimed was dangerous and impractical. He reneged on Tesla’s bonus, and the two became lifelong rivals. To demonstrate alternating current’s dangers, Edison launched the “War of the Currents,” using it to kill large animals (including an elephant). He also staged a gruesome human execution with the electric chair he secretly financed. Edison’s prime vision was of corporate-owned central power stations feeding a for-profit grid run for the benefit of capitalists like Morgan. Tesla became a millionaire working with industrialist George Westinghouse, who used alternating current to establish the first big generating station at Niagara Falls. But Morgan bullied him out of the business. A visionary rather than a capitalist, Tesla surrendered his royalties to help Westinghouse, then spent the rest of his haunted, complex careerpioneering various inventions meant to produce endless quantities of electricity and distribute it free and without wires. Meanwhile, the investor-owned utilities bearing Edison’s name and Morgan’s money built the new grid on the back of big coal-burners that poured huge profits into their coffers and lethal pollutants into the air and water. In the 1930s, Franklin Roosevelt’s New Deal established the federally owned Tennessee Valley Authority and Bonneville Power Project. The New Deal also strung wires to thousands of American farms through the Rural Electrification Administration. Hundreds of rural electrical cooperatives sprang up throughout the land. As nonprofits with community roots and ownership, the co-ops have generally provided far better and more responsive service than the for-profit investor-owned utilities. But it was another federal agency—the Atomic Energy Commission—that drove the utility industry to the crisis point we know today. Coming out of World War II, the commission’s mandate was to maintain our nascent nuclear weapons capability. After the bombings of Hiroshima and Nagasaki, it shifted focus, prodded by Manhattan Project scientists who hoped the “Peaceful Atom” might redeem their guilt for inventing the devices that killed so many. When AEC Chairman Lewis Strauss promised electricity “too cheap to meter,” he heralded a massive government commitment involving billions in invested capital and thousands of jobs. Then, in 1952, President Harry Truman commissioned a panel on America’s energy future headed by CBS Chairman William Paley. The commission reportembraced atomic power, but bore the seeds of a worldview in which renewable energy would ultimately dominate. Paley predicted the United States would have thirteen million solar-heated homes by 1975. Of course, this did not happen. Instead, the nuclear power industry grew helter-skelter without rational planning. Reactor designs were not standardized. Each new plant became an engineering adventure, as capability soared from roughly 100 megawatts at Shippingport in 1957 to well over 1,000 in the 1970s. By then, the industry was showing signs of decline. No new plant commissioned since 1974 has been completed. But with this dangerous and dirty power have come Earth-friendly alternatives, ignited in part by the grassroots movements of the 1960s. E.F. Schumacher’s Small Is Beautifulbecame the bible of a back-to-the-land movement that took a new generation of veteran activists into the countryside. Dozens of nonviolent confrontations erupted, with thousands of arrests. In June 1978, nine months before the partial meltdown at Three Mile Island, the grassroots Clamshell Alliance drew 20,000 participants to a rally at New Hampshire’s Seabrook site. And Amory Lovins’s pathbreaking article, “Energy Strategy: The Road Not Taken,” posited a whole new energy future, grounded in photovoltaic and wind technologies, along with breakthroughs in conservation and efficiency, and a paradigm of decentralized, community-owned power. As rising concerns about global warming forced a hard look at fossil fuels, the fading nuclear power industry suddenly had a new selling point. Climate expert James Hansen, former Environmental Protection Agency chief Christine Todd Whitman, and Whole Earth Catalog founder Stewart Brand began advocating atomic energy as an answer to CO2 emissions. The corporate media began breathlessly reporting a “nuclear renaissance” allegedly led by hordes of environmentalists. But the launch of Peaceful Atom 2.0 has fallen flat. As I recently detailed in an online article for The Progressive, atomic energy adds to rather than reduces global warming. All reactors emit Carbon-14. The fuel they burn demands substantial CO2 emissions in the mining, milling, and enrichment processes. Nuclear engineer Arnie Gundersen has compiled a wide range of studies concluding new reactor construction would significantly worsen the climate crisis. Moreover, attempts to recycle spent reactor fuel or weapons material have failed, as have attempts to establish a workable nuclear-waste management protocol. For decades, reactor proponents have argued that the barriers to radioactive waste storage are political rather than technical. But after six decades, no country has unveiled a proven long-term storage strategy for high-level waste. For all the millions spent on it, the nuclear renaissance has failed to yield a single new reactor order. New projects in France, Finland, South Carolina, and Georgia are costing billions extra, with opening dates years behind schedule. Five projects pushed by the Washington Public Power System caused the biggest municipal bankruptcy in U.S. history. No major long-standing green groups have joined the tiny crew of self-proclaimed “pro-nuke environmentalists.” Wall Street is backing away. Even the split atom’s most ardent advocates are hard-pressed to argue any new reactors will be built in the United States, or more than a scattered few anywhere else but China, where the debate still rages and the outcome is uncertain. Today there are about 100 U.S. reactors still licensed to operate, and about 450 worldwide. About a dozen U.S. plants have shut down in the last several years. A half dozen more are poised to shut for financial reasons. The plummeting price of fracked gas and renewable energy has driven them to the brink. As Gundersen notes, operating and maintenance costs have soared as efficiency and performance have declined. An aging, depleted skilled labor force will make continued operations dicey at best. And nuclear plants have short lifespans for safe operation. “When the reactor ruptured on March 11, 2011, spewing radioactivity around the northern hemisphere, Fukushima Daiichi had been operating only one month past its fortieth birthday,” Gundersen says. But the nuclear power industry is not giving up. It wants some $100 billion in state-based bailouts. New York Governor Andrew Cuomo recently pushed through a $7.6 billion handout to sustain four decrepit upstate reactors. A similar bailout was approved in Ohio. Where once it demanded deregulation and a competitive market, the nuclear industry now wants re-regulation and guaranteed profits no matter how badly it performs. The grassroots pushback has been fierce. Proposed bailouts have been defeated in Illinois, but then approved. They are under attack in New York and Ohio, but their future is uncertain. A groundbreaking agreement involving green and union groups has set deadlines for shutting the Diablo reactors, with local activists demanding a quicker timetable. Increasingly worried about meltdowns and explosions, grassroots campaigns to close old reactors are ramping up throughout the United States and Europe. Citizen action in Japan has prevented the reopening of nearly all nuclear plants since Fukushima. Envisioning the “nuclear interruption” behind us, visionaries like Lovins see a decentralized “Solartopian” system with supply owned and operated at the grassroots. The primary battleground is now Germany, with the world’s fourth-largest economy. Many years ago, the powerful green movement won a commitment to shut the country’s fossil/nuclear generators and convert entirely to renewables. But the center-right regime of Angela Merkel was dragging its feet. In early 2011, the greens called for a nationwide demonstration to demand the Energiewende, the total conversion to decentralized green power. But before the rally took place, the four reactors at Fukushima blew up. Facing a massive political upheaval, and apparently personally shaken, Chancellor Merkel (a trained quantum chemist) declared her commitment to go green. Eight of Germany’s nineteen reactors were soon shut, with plans to close the rest by 2022. That Europe’s biggest economy was now on a soft path originally mapped out by the counterculture prompted a hard response of well-financed corporate resistance. “You can build a wind farm in three to four years,” groused Henrich Quick of 50 Hertz, a German transmission grid operator. Indeed, the transition is succeeding faster and more profitably than its staunchest supporters imagined. Wind and solar have blasted ahead. Green energy prices have dropped and Germans are enthusiastically lining up to put power plants on their rooftops. Sales of solar panels have skyrocketed, with an ever-growing percentage of supply coming from stand-alone buildings and community projects. The grid has been flooded with cheap, green juice, crowding out the existing nukes and fossil burners, cutting the legs out from under the old system. In many ways it’s the investor-owner utilities’ worst nightmare, dating all the way back to the 1880s, when Edison fought Tesla. Back then, the industry-funded Edison Electric Institute warned that “distributed generation” could spell doom for the grid-based industry. That industry-feared deluge of cheap, locally owned power is now at hand. In the United States, state legislatures dominated by the fossil fuel-invested billionaire Koch brothers have been slashing away at energy efficiency and conservation programs. Ohio, Arizona, and other states that had enacted progressive green-based transitions are now shredding them. In Florida, a statewide referendum pretending to support solar power was in fact designed to kill it. In Nevada, homeowners who put solar panels on their rooftops are under attack. The state’s monopoly utility, with support from the governor and legislature, is seeking to make homeowners who put solar panels on their rooftops pay more than others for their electricity. But it may be too little, too late. In its agreement with the state, unions, and environmental groups, Pacific Gas and Electric has admitted that renewables could, in fact, produce all the power now coming from the two decaying Diablo nukes. The Sacramento Municipal Utility District shut down its one reactor in 1989 and is now flourishing with a wave of renewables. The revolution has spread to the transportation sector, where electric cars are now plugging into outlets powered by solar panels on homes, offices, commercial buildings, and factories. Like nuclear power, the gas-driven automobile may be on its way to extinction. Nationwide, more than 200,000 Americans now work in the solar industry, including more than 75,000 in California alone. By contrast, only about 100,000 people work in the U.S. nuclear industry. Some 88,000 Americans now work in the wind industry, compared to about 83,000 in coal mines, with that number also dropping steadily. Once the shining hope of the corporate power industry, atomic energy’s demise represents more than just the failure of a technology. It’s the prime indicator of an epic shift away from corporate control of a grid-based energy supply, toward a green power web owned and operated by the public. As homeowners, building managers, factories, and communities develop an ever-firmer grip on a grassroots homegrown power supply, the arc of our 128-year energy war leans toward Solartopia. Harvey Wasserman’s Solartopia! Our Green-Powered Earth is at solartopia.org. His Green Power & Wellness Show is at prn.fm. He edits nukefree.org. 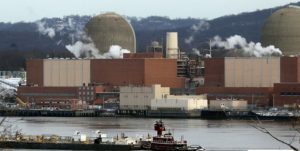 The good—the very good—energy news is that the Indian Point nuclear power plants 26 miles north of New York City will be closed in the next few years under an agreement reached between New York State and the plants’ owner, Entergy. New York Governor Andrew Cuomo has long been calling for the plants to be shut down because, as the New York Timesrelated in its story on the pact, they pose “too great a risk to New York City.” Environmental and safe-energy organizations have been highly active for decades in working for the shutdown of the plants. Under the agreement, one Indian Point plant will shut down by April 2020, the second by April 2021. They would be among the many nuclear power plants in the U.S. which their owners have in recent years decided to close or have announced will be shut down in a few years. This comes in the face of nuclear power plant accidents—the most recent the ongoing Fukushima nuclear disaster in Japan—and competitive power being less expensive including renewable and safe solar and wind energy. Last year the Fort Calhoun nuclear plant in Nebraska closed following the shutdowns of Kewanee in Wisconsin, Vermont Yankee in Vermont, Crystal River 3 in Florida and both San Onofre 2 and 3 in California. Nuclear plant operators say they will close Palisades in Michigan next year and then Oyster Creek in New Jersey and Pilgrim in Massachusetts in 2019 and California’s Diablo Canyon 1 in 2024 and Diablo Canyon 3 in 2025. This brings the number of nuclear plants down to a few more than 90—a far cry from President Richard Nixon’s scheme to have 1,000 nuclear plants in the U.S. by the year 2000. But the bad—the very bad—energy news is that there are still many promoters of nuclear power in industry and government still pushing and, most importantly, the transition team of incoming President Donald Trump has been “asking for ways to keep nuclear power alive,” as Bloomberg News reported last month. As I was reading last week the first reports on the Indian Point agreement, I received a phone call from an engineer who has been in the nuclear industry for more than 30 years—with his view of the situation. The engineer, employed at nuclear plants and for a major nuclear plant manufacturer, wanted to relate that even with the Indian Point news—“and I’d keep my fingers crossed that there is no disaster involving those aged Indian Point plants in those next three or four years”—nuclear power remains a “ticking time bomb.” Concerned about retaliation, he asked his name not be published. Here is some of the information he passed on—a story of experiences of an engineer in the nuclear power industry for more than three decades and his warnings and expectations. Several months after the accident at the Three Mile Island nuclear plant in Pennsylvania in March 1979, the nuclear industry set up the Institute of Nuclear Power Operations (INPO) based in Atlanta, Georgia. The idea was to have a nuclear industry group that “would share information” on problems and incidents at nuclear power plants, he said. If there is a problem at one nuclear power plant, through an INPO report it is communicated to other nuclear plant operators. Thus the various plant operators could “cross-reference” happenings at other plants and determine if they might apply to them. The reports are “coded by color,” explained the engineer. Those which are “green” involve an incident or condition that might or might not indicate a wider problem. A “yellow” report is on an occurrence “that could cause significant problems down the road.” A “red” report is the most serious and represents “a problem that could have led to a core meltdown”—and could be present widely among nuclear plants and for which action needs to be taken immediately. If the general public would see these “red” reports, its view on nuclear power would turn strongly negative, said the engineer. The U.S. Nuclear Regulatory Commission (NRC) is supposed to be the federal agency that is the watchdog over nuclear power plants and it frequently boasts of how it has “two resident inspectors” at each nuclear power plant in the nation, he noted. “The inspectors hands are tied,” said the engineer. When nuclear power plants were first designed decades ago, explained the engineer, the extent of their mechanical life was established at 40 years. The engineer is highly familiar with these calculations having worked for a leading manufacturer of nuclear plants, General Electric. The components in nuclear plants, particularly their steel parts, “have an inherent working shelf life,” said the engineer. Thus the U.S. government limited the operating licenses it issued for all nuclear power plants to 40 years. However, in recent times the NRC has “rubber-stamped license extensions” of an additional 20 years now to more than 85 of the nuclear plants in the country—permitting them to run for 60 years. Moreover, a push is now on, led by nuclear plant owners Exelon and Dominion, to have the NRC grant license extensions of 20 additional years—to let nuclear plants run for 80 years. Exelon, the owner of the largest number of nuclear plants in the U.S., last year announced it would ask the NRC to extend the operating licenses of its two Peach Bottom plants in Pennsylvania to 80 years. Dominion declared earlier that it would seek NRC approval to run its two Surry nuclear power plants in Virginia for 80 years. Further, what the NRC has also been doing is not only letting nuclear plants operate longer but “uprating” them—allowing them to run “hotter and harder” to generate more electricity and ostensibly more profit. “Catastrophe is being invited,” said the engineer. A big argument of nuclear promoters in a period of global warming and climate change is that “reactors aren’t putting greenhouse gases out into the atmosphere,” noted the engineer. But this “completely ignores” the “nuclear chain”—the cycle of the nuclear power process that begins with the mining of uranium and continues with milling, enrichment and fabrication of nuclear fuel “and all of this is carbon intensive.” There are the greenhouse gasses discharged during the construction of the steel and formation of the concrete used in nuclear plants, transportation that is required, and in the construction of the plants themselves. “It comes back to a net gain of zero,” said the engineer. And every nuclear power plant needs to be shut down. Karl Grossman, professor of journalism at the State University of New York/College of New York, is the author of the book, The Wrong Stuff: The Space’s Program’s Nuclear Threat to Our Planet. Grossman is an associate of the media watch group Fairness and Accuracy in Reporting (FAIR). He is a contributor to Hopeless: Barack Obama and the Politics of Illusion. The Unit 2 reactor will permanently cease operations no later than April 30, 2020 and the Unit 3 reactor will permanently cease operations no later than April 30, 2021. Entergy will also move a set yearly number of spent fuel rods from their dangerous storage pools to dry cask storage on site — a much safer solution for this radioactive material. Riverkeeper retains the right to compel full compliance with the closure agreement. Riverkeeper and Scenic Hudson have the right to challenge and take enforcement action against any future violations Entergy may commit at Indian Point. The agreement includes an emergency provision that will allow the reactors to remain open for a maximum of four additional years — subject to approval by New York State — only by reason of war, a sudden increase in electrical demand, or a sudden shortage of electric energy. Riverkeeper and Scenic Hudson will be able to challenge any extension of the 2020 and 2021 closure deadlines. Entergy will amend its relicensing request to the Nuclear Regulatory Commission, asking for renewals until 2024 for Unit 2 and 2025 for Unit 3, accounting for the four additional “emergency” years. New safety inspections of “core baffle former” bolts. Entergy will conduct visual and ultrasonic inspections of critical baffle former bolts — which fasten together the plates surrounding the nuclear fuel that direct cooling water entering the reactor vessel — in Unit 3 in spring 2017 and in Unit 2 in 2018 and a repeat inspection for Unit 3 in 2019. It will also inspect all new bolts for degradation and replace bolts that are deficient. Annual inspections by New York State. Entergy has agreed to annual inspections by state-designated representatives on issues pertaining to continued operation of its two reactors through 2021. The duration and scope of, and participation in, the inspections will be agreed upon by Entergy and New York State in advance of each inspection. Creation of a $15 million environment and community fund. To compensate for impacts on the Hudson River during the closure period, Entergy will establish a $15 million fund for river restoration and remediation as well as projects providing public benefits to the community. Environmental funding will prioritize dam removal, wetlands protection, control of invasive species and habitat surveys. Scenic Hudson and Riverkeeper have been fighting for changes to Indian Point’s operations to halt the the killing of billions of aquatic organisms by its antiquated once-through cooling technology. Decades of such slaughter and habitat degradation have contributed to the decline of numerous important fish species in the river. Both organizations have also called for the plant’s shutdown, based on concerns related to safety, security, and environmental impacts, and have worked with many groups and state agencies toward this objective. Parties in the agreement include Riverkeeper, the State of New York, NYS Office of the Attorney General, NYS Department of Environmental Conservation, NYS Department of Health, NYS Department of State, NYS Department of Public Service, Entergy Nuclear Indian Point 2, LLC, Entergy Nuclear Indian Point 3 LLC and Entergy Nuclear Operations. 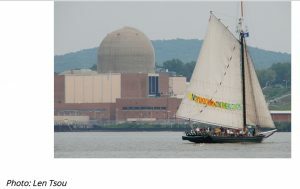 Cross-posted from Riverkeeper.org by Myla Reson – No Nukes! BEACON, NY – Hudson River Sloop Clearwater, America’s Environmental Flagship who has long fought for the closure of the Indian Point Nuclear Power Plant in Buchanan, NY received news this afternoon that the power plant would be closed in 2021, as the result of an agreement being negotiated by New York State with the plant’s owners, Entergy. Reactor Unit 2 of the plant is due to close in April 2020, and Unit 3, which would close down the plant for good, is due to close in April 2021. Unit One, which did not meet earthquake standards, closed in 1974. Citing dangers to public health and safety and ecological damage to the Hudson River, Clearwater has long advocated for the closure of Indian Point. “The intense water withdrawals used to cool the plant will continue to harm Hudson River fish and other aquatic species. This means four more years of massive fish kill, including billions of eggs and larvae through April 2021,” said Dave Conover, Clearwater’s Interim Executive Director. “The good news is that they have agreed to move old (but still highly radioactive) fuel rods from the severely overcrowded fuel pools, to safer dry-cask storage, to make long-overdue repairs, and to allow more inspections and better oversight” said Greene. To execute the shutdown, a transition plan must protect workers; retaining those who have institutional memory to ensure safe decommissioning. Recently a phase out plan was negotiated for Diablo Canyon, the last operating nuclear plant in California, which is scheduled to close in 6 years. Their transition plan includes replacing the aging nuclear facility with 100% renewable energy, while retaining the most valuable workers, and retraining those who are not as needed after closure for jobs in the renewable energy industry. 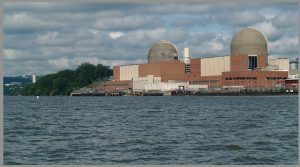 Clearwater believes that the New York plan for a “just” transition should include New York’s entire nuclear fleet of six reactors, and be based on realistic but accelerated implementation of on- and off-shore wind, community and large-scale solar, more large and low-impact hydroelectric facilities, with robust storage systems to ensure reliability. Even without a plan for renewable replacement energy in place, both the NY State Independent System Operators and the NYS Department of State have determined that there is currently sufficient energy on the grid to do without Indian Point due to energy efficiency and reduced energy consumption and the rapid increase in renewable resources. Clearwater is also calling for a comprehensive plan to ensure safe decommissioning that is funded by Entergy, and doesn’t end up becoming a burden to ratepayers or taxpayers. An amended petition is due to be filed next week. Media Contact: Manna Jo Greene, Environmental Action Director, Hudson River Sloop Clearwater (845) 807-1270. RSVP via Ilene Proctor at (310)858-6643 ilenepr@sbcglobalnet. Jan Goodman, jansorders@gmail.com (310) 729-2394. Free & open to the public. Donations accepted.